The cargo for the first revenue-generating drone delivery in the United States wasn’t an Amazon package or 7-Eleven Slurpee — it was blood. On Tuesday, UPS launched a new service using drones to transport blood and other medical samples between the various buildings at WakeMed Raleigh’s medical campus in North Carolina — and the speed at which the drones deliver the samples could literally be the difference between life and death. 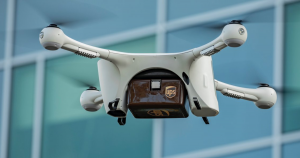 UPS’s new service makes use of autonomous drone developer Matternet’s M2 quadcopter, which can reportedly carry a payload of up to five pounds a distance of approximately 20 kilometers (12.5 miles). Medical professionals at WakeMed’s nearby facilities load the drone’s secure container with blood samples or other medical specimens, and the drone then follows a fixed path to the healthcare system’s main hospital and pathology lab for unloading. According to Business Insider, this trek could take drivers up to 30 minutes depending on traffic, but UPS’s unmanned drones can cut delivery time down to just three minutes and 15 seconds. For now, UPS expects the drones to make fewer than 10 deliveries per day on the WakeMed campus, but that could increase in the future — especially if the service proves as beneficial as UPS expects.